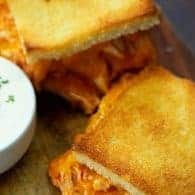 Football season is coming and this buffalo chicken grilled cheese in the oven is the perfect football food! It serves a crowd and is always a hit! Spicy, cheesy, and perfect for dipping in ranch or blue cheese dressing. I think it’s well known that I attend football related events solely for the food. I mean, if you want to watch a bunch of grown men risk life and limb to chase a ball, then by all means, go for it. I’m just…not interested. I am suuuuuuper excited for football food though. It’s probably my favorite cuisine. This year, I’m serving up hungry football fans a big ol’ grilled cheese. Have you ever made a grilled cheese in the oven? 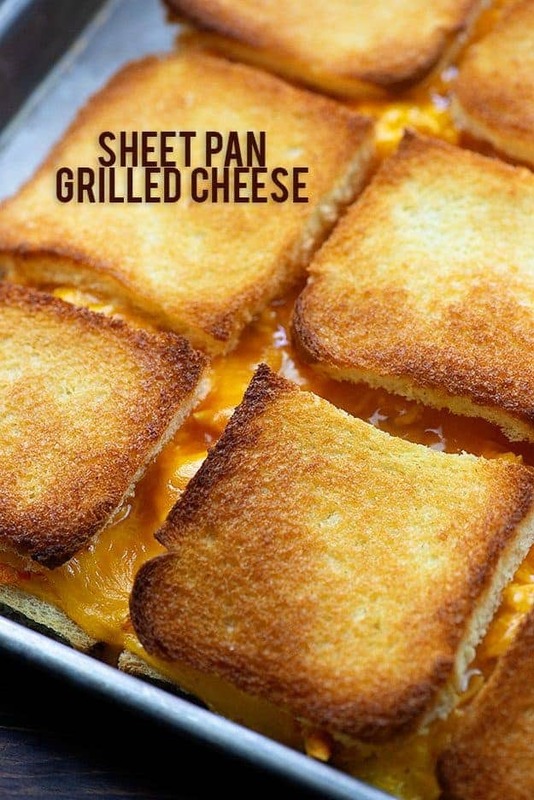 It’s so much easier than cooking them on the stove and this is a SHEET PAN grilled cheese! So it’s huge and it feeds a crowd. Did I mention the buffalo chicken hiding inside? Sooooo good, you guys! I started this recipe by cutting the crusts off of a loaf of bread. You don’t technically have to do this, but it helps the bread fit in the pan a little better and I just think it’s tastier without the crust. You do you, though. 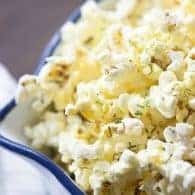 Melt some butter and pour it onto a rimmed sheet pan. Spread it all around and then top it off with a single layer of bread slices. 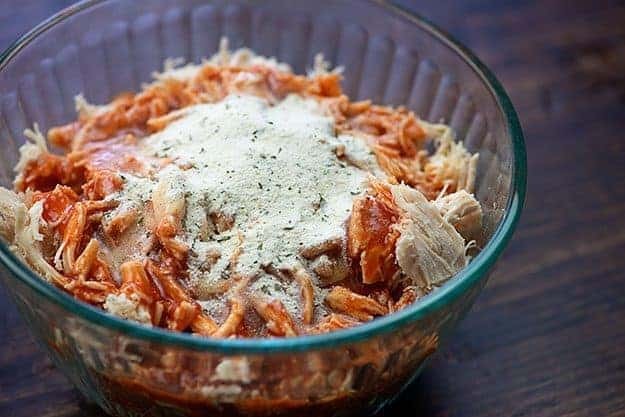 Add some shredded chicken to a bowl along with some hot sauce and ranch dressing mix. Stir that up. This chicken is sooooo good! 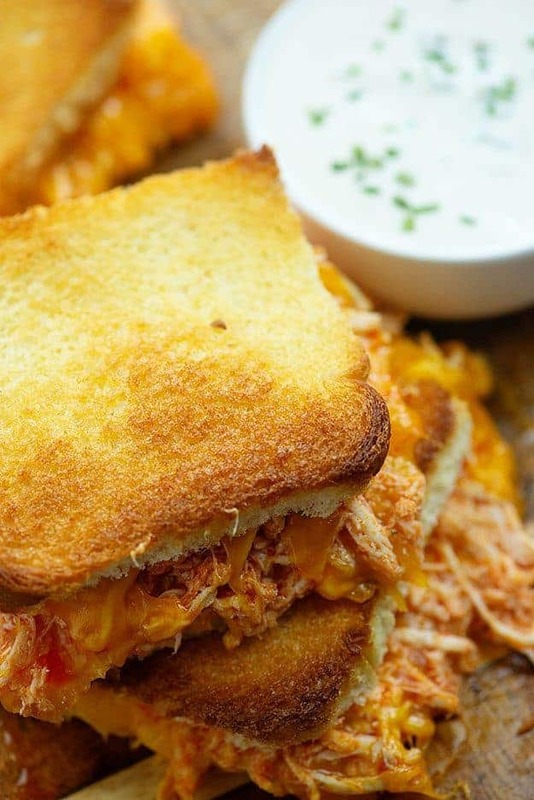 Top the bread with slices of cheddar and the buffalo chicken mixture. Don’t forget the sliced cheddar! You need lots o’ cheese for a grilled cheese sandwich, y’all. Top these off with more bread and brush the tops with melted butter. Into the oven with your massive grilled cheese sandwich! What comes out is toasty melty perfection! 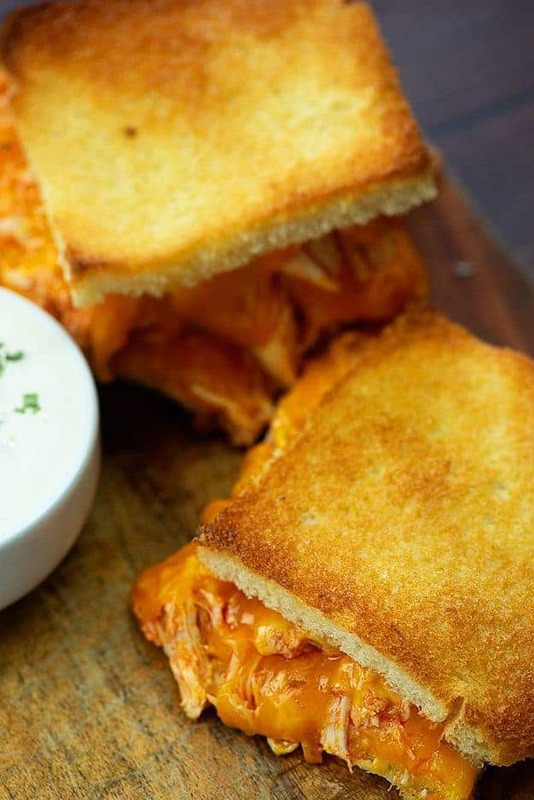 We dip our buffalo chicken grilled cheese in ranch dressing, but blue cheese would work just as well. Use whichever you like best! Taco Chili: A big pot of chili with the flavors of a taco. Hard to go wrong! 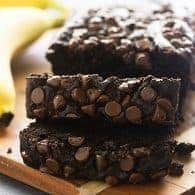 Homemade Brownies: You need these in your life. Fruit Pizza: Always a hit!! 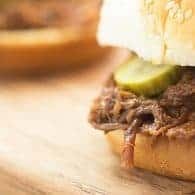 French Dip Sandwich: One of the most popular recipes on this site! 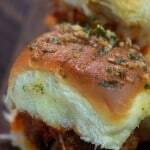 Grape Jelly Meatballs: A classic! Buffalo Chicken Meatballs: You can’t go wrong with buffalo chicken! Grilled cheese doesn't get any easier than this! 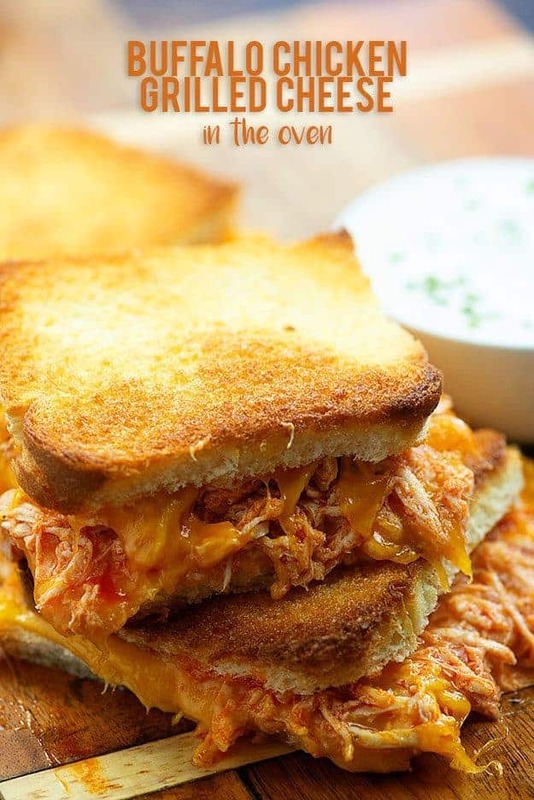 It's baked in the oven and it's spiced up with all the goodness of buffalo chicken. Perfect for game day! 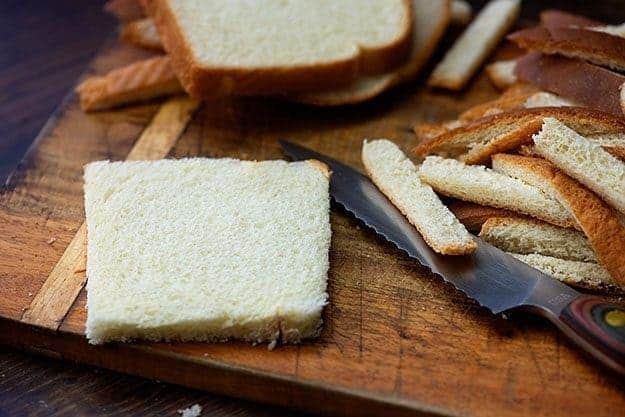 Cut the crust off the bread. Pour 1/4 cup of butter into a rimmed half sheet pan. Place 12 slices of bread in the pan to cover. Top the bread with 12 slices of cheddar. Add the chicken, hot sauce, and ranch seasoning to a mixing bowl and stir well to coat. 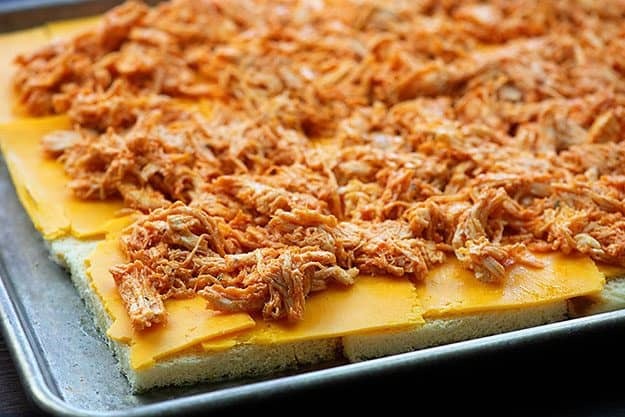 Spread chicken over the cheese in an even layer. Top with the remaining cheese and bread slices. 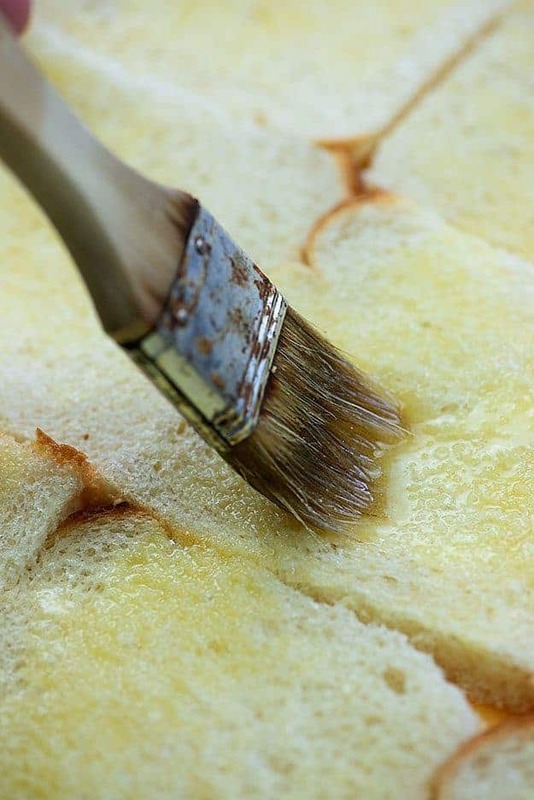 Use a pastry brush to brush the remaining butter over the tops of the sandwiches. Bake for 15 minutes or until golden brown and crunchy. 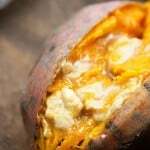 Serve hot with blue cheese or ranch dressing, as desired. You are the genius of now why didn’t I think of that! I love oven/AF grilled cheese, it’s so much better than from a skillet, it gets so crunchy! But, putting buffalo chicken on it, I’m ALL in! Karly – This sounds like a great crowd pleaser but I am confused. In the recipe you state in the ingredients “24” slices of bread. In the recipe, your directions are to place 15 slices of bread on the buttered sheet pan, add the toppings, etc then top with remaining bread which would only be only 9 slices of bread. It this count correct? Or should there be 30 slices of bread-15 for the bottom and 15 to top off? Thanks for sharing! Well my goodness, that recipe was a mess. It should be 24 total pieces of bread, with two layers of 12 each, creating a total of 12 sandwiches. Sorry for the confusion! Thanks Karly- You’re The Best! I so love your recipes. Thank you for sharing and dedicating the time to share. I am also confused These are not individual sandwiches but need to be cut to served?